Apple’s Mac business isn’t growing as fast as it did last Christmas, despite weak comps, but it’s still performing ahead of expectations. 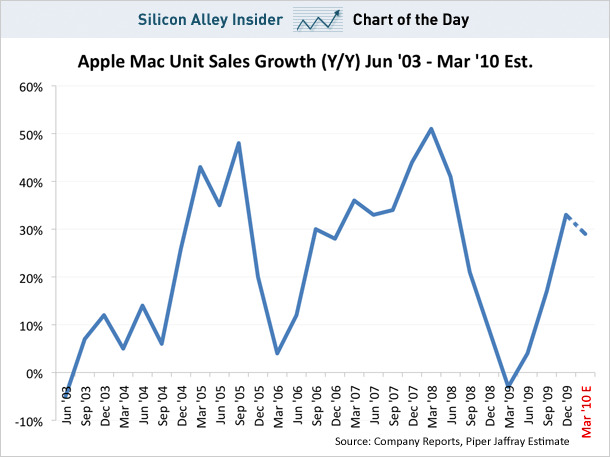 In a note Monday, Piper Jaffray analyst Gene Munster said he expected Apple to report Mac year-over-year unit sales growth of 26% to 31% for the March quarter, above the Street’s expected 22% year-over-year growth. 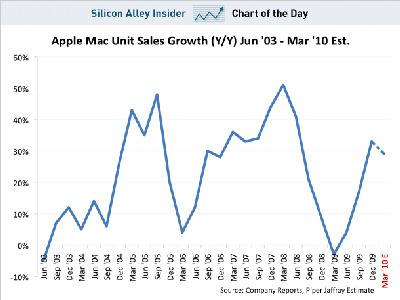 It’ll be interesting to see how the iPad affects the Mac business starting in the June quarter. It may attract more people into Apple Stores, who end up buying MacBooks. But it could also cannibalise low-end MacBook sales. Apple’s bet is that it won’t, but will instead become a third category of device, competing mostly with PC netbooks and e-book readers.